To understand the political systems of the European countries. Constitutional Monarchies: Belgium, Denmark, Spain, the Netherlands, Sweden, Luxemburg and the United Kingdom. Federal Republics: Germany and Austria. Centralised Republics: Bulgaria, Cyprus, Malta, Czech Republic, Estonia, Finland, Franca, Greece, Hungary, Ireland, Italy, Latvia, Lithuania, Poland, Portugal, Romania, Slovakia and Slovenia. In the constitutional monarchies, the head of state is the monarch, who has no truly political powers, whose main function is to represent the state. In contrast, in the republics, the head of state is chosen by the citizens, either directly or through the parliament. The difference between the centralised and federal republics lies in the level of political decentralisation. In the former, the regions have only limited competences and it is the central government that decides on the majority of issues. However, in the federal republics, the regions have a larger number of competences and also have legislative assemblies. There are also other cases in which it is relatively difficult to classify a country based on its political organisation. For example, in Belgium there is a parliamentary monarchy established in conjunction with a federal state. In the case of Spain, the autonomous communities have been devolved powers that are comparable with those of many federal states. Is it possible to identify the systems of government of the countries of the EU? >15 Division of powers between the European Union, the member states, and the regional and local authorities (en). 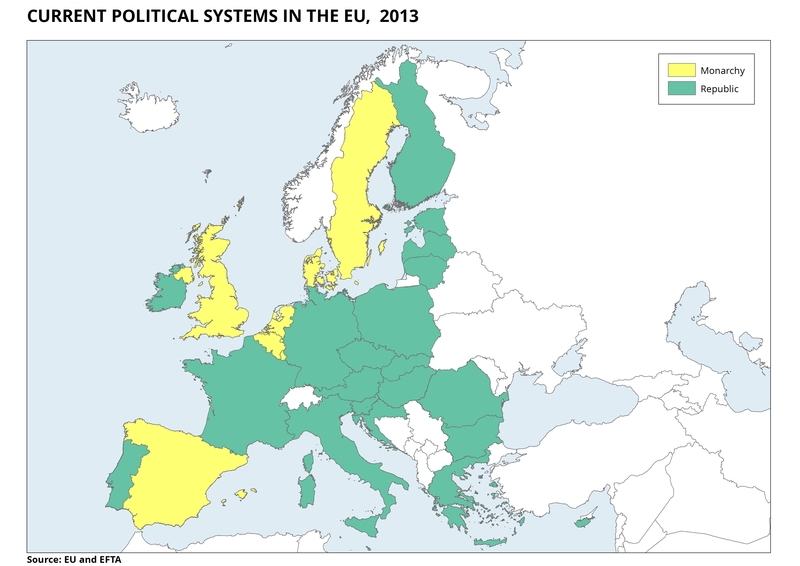 Systems of government in Europe and the different levels of government, electoral systems, executive powers, competences and intergovernmental relations and also the dimensions of the EU. 30 case studies of European countries, detailing their systems of government and electoral systems, the competences of their different levels of administration and their intergovernmental relations and participation in the EU. "This project has been funded with support from the European Commission. This publication reflects the views only of the author, and the Commission cannot be held responsible for any use which may be made of the information contained therein."